Snuggled between the Sunshine and Gold Coasts of Eastern Australia is the nations third largest city, Brisbane. This picturesque metropolis stands on the original European settlement and is cut in half by the impressive, but rather obviously named, Brisbane River. Out For Lunch hooked up with a local food blogger, Cookie Jen, to find her take on the city’s best burger joint. The Joint: Miel Container, 96 Albert Street, Brisbane, Queensland, Australia. You can ‘like’ their Facebook profile here. The Vibe: Found at the heart of Brisbane’s central business district, Miel Container has gained a reputation for it’s awesome burgers and it’s whole heartedly deserved. 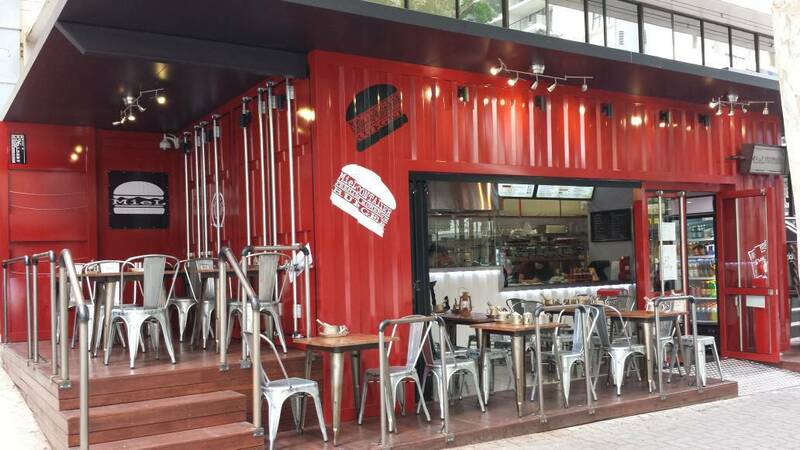 The modified shipping container is a thriving joint that has been serving some of Brisbane’s best patties since August 2013. It’s tight on space, regularly overflowing, but definitely worth the wait. The menu is pretty adventurous for a burger joint too. First you’ve got their ‘Design Your Burger’ menu. This starts with with either a ciabatta or brioche bun, your choice of beef, chicken, fish, or fried vegetables burger, and then stacks of varied toppings such as eggs, bacon, and avocados for a few more dollars. It’s a little daunting at first and can ramp the cost up. You’ve then got a range of ‘Classics’ and it’s their Koren BBQ Bulgogi burger that catches our eye first. Here you have a thin (their words, not ours) cut of marinated Korean beef served with tasty cheese, a stack of salad, soy sauce, and bean paste mayo. It’s a meaty burger with a great taste and a clever change from your average burger. It’s also crammed inside a glazed brioche bun too, for that added mark of quality. Miel also run a weekly range of specials, limited edition burgers that are hard to get your hands on. Those fortunate enough to grab one were treated to a spicy lamb burger covered in a slice of melted cheese and bedded down with a generous helping of salad. The added kick from the spices really added to the taste and the sesame bun was a great accompaniment. Miel Container are serving up some of the best burgers in Brisbane right now and, although it can be extremely busy, they’re worth sticking around for. The Price: Miel Container will set you back $12+ for a burger, and a sizeable $5+ for sides. It’s not cheap but then it is in Melbourne. Miel Container was visited by Jen in August 2014. You can find out more about Jen by heading to her CookieJen website and reading more of her great reviews: Cookie Jen. Posted in BrisbaneTagged albert street, Australia, avocados, bacon, BBQ, beef, brioche, Brisbane, brisbane CBD, brisbane river, bulgogi, Burgers, chicken, ciabatta, Cookie Jen, eggs, fish, koren, lamb, lunch, miel, miel container, queenslandBookmark the permalink.